There's so much information out there on the best methods and techniques for coaching your players. Whether you are new to coaching or eager to keep improving, here are 10 important lessons to help you this year. Make sure you share this with other coaches! It's said that 10,000 hours of work is required to be elite in your field. This shouldn't just be spent planning and delivering your sessions. Reviewing sessions and matches is proving to be highly valuable to improving performance. If you have taken an RFU Coaching Qualification you will be aware that using the Process Skills will enhance your coaching and your players' experience. Don't fall into the trap of being the centre of attention and the focus of the coaching session! Talk less, listen more, and give the players a role to play in how the session goes. Kids and adults are the same. If a session is fun, players will be better motivated, learn quicker and turn up to training more frequently. If you do nothing else as a coach - have fun! The development of coaching understanding through the use of games continues to improve within the professional and grassroots games. When pushed for time or when looking for context and understanding; using games is essential to a coaches toolbox. From a coaching point of view it's the time keeping, self-discipline, coaches behaviour and enjoying what you do. You can be experts in all of these no matter what your Rugby knoweldge is like! Building rapport is an especially important skill to learn in order to get on the same page as your players. Rules and regulations change every season, keep up to date with what skills your players require as they progress through the age groups. 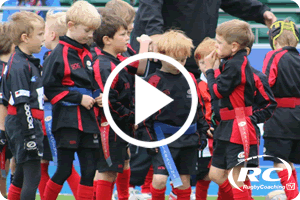 Here are some key focus points for coaching minis! In this year's 6 Nations and Autumn internationals being able to keep the ball alive really set some teams above the rest! The desire to pass rather than ruck or take contact led to a dynamic style of play that led to them being very exciting to watch and hard to play against. Take your time on the core skills! A questioning style has a strong influence on how the coach can pull the knowledge from the players rather than push the knowledge onto them. Try more of this and see how your sessions improve! Even the best coaches in the world are continuously learning! A great way to do this is to watch other coaches. 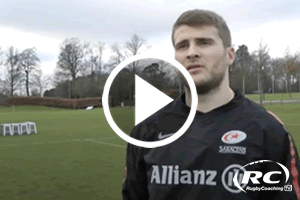 Use RugbyCoaching.tv to watch over 2000 rugby coaching drills, games and interviews!